Pineapple is a fruit that grills beautifully. It holds together well and a light charring enhances its natural tropical sweetness. 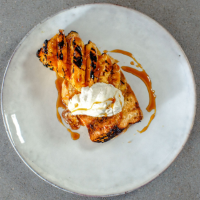 The spiced rum caramel works as a great glaze and also doubles up as a sauce at the end, but it can burn easily whilst you’re grilling so keep the pineapple moving as it cooks. 1. Bring the sugar, water and star anise to the boil in a large non-stick frying pan and boil for 7-8 minutes. As soon it reaches a dark amber colour, remove from the heat and stir in the rum. Combine the ingredients for the vanilla cream in a large bowl, whisk to soft peaks then cover and chill. 2. Preheat the barbecue for direct grilling. Thread each pineapple quarter onto a skewer, brush with the caramel then grill for 7-8 minutes, turning regularly and brushing with the caramel until softened and lightly charred. Remove from the heat and give a final brush with the caramel. 3. Brush the brioche slices with butter and lightly toast on the barbecue. Serve the pineapple with the brioche, vanilla cream and a drizzle of any leftover caramel. Cooks tip: You will need 4 skewers. If using wooden skewers, soak in warm water for an hour to avoid burning.